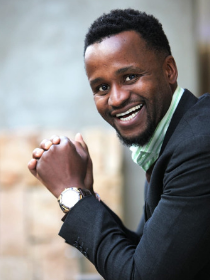 Mzwethemba Dlutu (better known as “Shakes”) is a motivational speaker, facilitator of group effectiveness processes, energetic MC for your activation events and conferences and also designs and runs innovative youth developments solutions for both schools and the South African youth market. Shakes also facilitates weekend teacher development workshops to assist teachers to reignite their passion for their profession. His personal mission statement is to “Constantly add value to peoples’ lives, by empowering them to believe in themselves”. He first became interest in the field of Personal Development in 1995 when he was a student in the R.A.L.I Project, a rich and diverse multicultural youth leadership programme. He went on to make history in the organization, by not only becoming the first student to be a R.A.L.I trainer/facilitator, but was also the first black person to do so. Shakes has extensive experience in his field, and also has the unique ability to connect with people from different walks of life. He is a natural and gifted speaker who uses humour and entertainment to drive home a powerful solid message. He has formal training on how to facilitate group processes through the South African College of Applied Psychology. In addition to this Shakes has been extremely privileged to have been mentored by John Kehoe, founder and author of Mind Power into the 21st Century. He is also coached and working very closely with Robin Banks who runs Mind Power course in South Africa. His favourite programs are the four week “Mind Power” course and the “Victim to Victor” workshop, a powerful catalysing process designed to “Create an Awareness of the power if mindsets and their implications”. Since 1994 “Victim to Victor” has enjoyed tremendous success throughout the country and has made an impact on the lives of more than 500, 000 South Africans. His motivational presentations are based on the “Victim to Victor” workshop and will give you a taste of some of the key principles from the program. It is guaranteed that you will leave this talk feeling highly motivated, having challenged your own mindset and will be inspired to implement these concepts in your personal and professional life. In our unique experiential-learning classroom, we guide participants to a clear understanding of the factors that build cooperation, teamwork and that strengthen leadership. Our team-effectiveness programmes cater for all teams. Whether your team is newly formed or has been together for years, or you’re looking to improve your team’s performance or generate more group cohesion, Shakes will assist you to reach your goals. Our workshops are custom-designed for each client, based on comprehensive pre-workshop ‘Team Assessments’ and ‘Development Indicators’. Your specific objectives and desired outcomes are identified in conjunction with your staff (ie. managers and team leaders), to ensure best results and return on investment. All of our workshops are progressive in nature and are based on proven experiential learning, group dynamics and personal mastery methods. We offer follow-up sessions to ensure that the outcomes are implemented and integrated. “We hereby wish to express our thanks for the excellent motivational speaker, Mzwethemba “Shakes” Dlutu, who you referred to us. Shakes truly inspired and motivated us and gave us a new insight into ourselves and others.” Barry Isaacs, Deputy Director, EMDC Education Department Western Cape.